← I Can See Clearly Now…WIAW!! I always get a little thrown off after WIAW! I forget where I did what and when! I guess I could look at my Weight Watcher’s journal, but that’s never near me when I’m posting…Anyway! Since I was able to get to the produce stand earlier in the week, I am back on the all things veggie bandwagon. I feel so much better when I have all my veggies here and ready to be cooked up. I planned on doing some roasting, but I’m cooking them up so fast that I may need to shop before I roast! The usual characters showed up for this veggie combo. 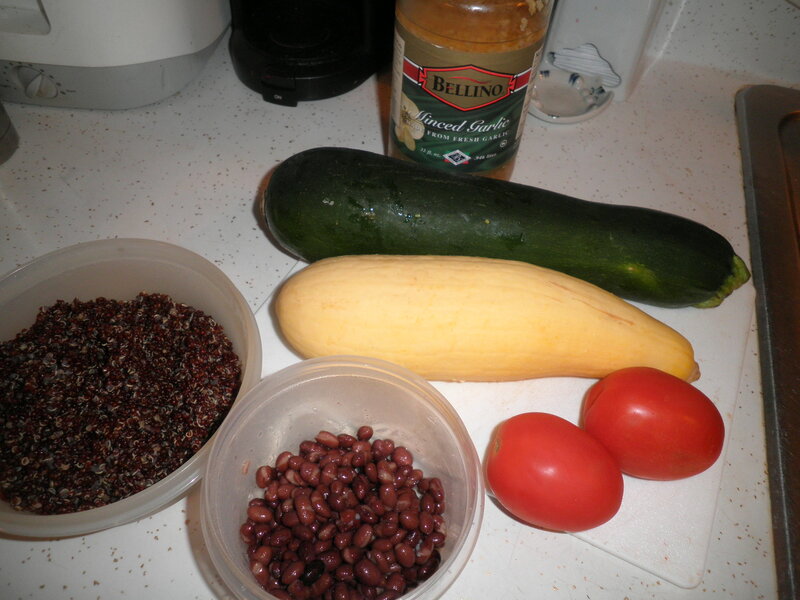 Garlic, tomatoes, yellow squash, zucchini, canned black beans and a new member of the cast, red quinoa which I talked about yesterday. 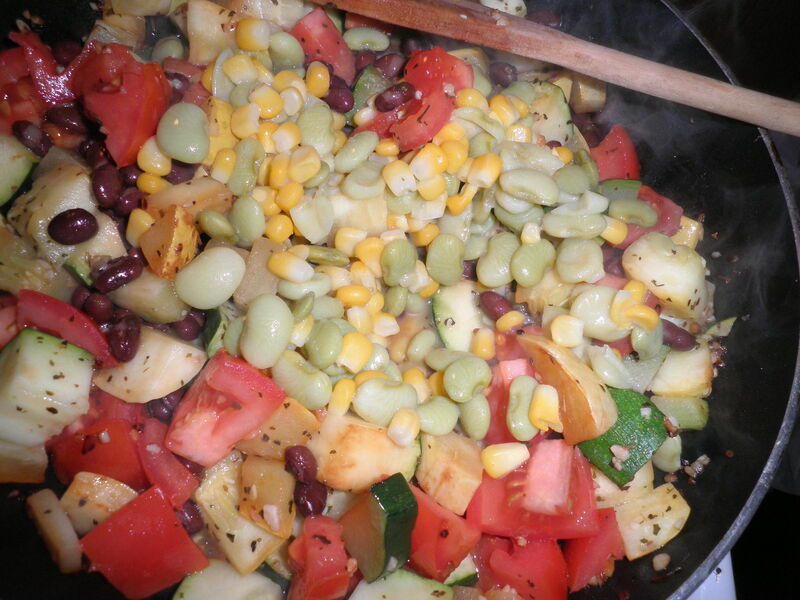 I was given custody of the leftover succotash from Thanksgiving (ask me if I’m happy?!?) so I added about three-quarters of a cup. Pardon me while I take a moment to do my happy dance. Topped off with some mozzarella cheese and sriracha sauce. I keep forgetting that I bought some of the garlic chili sauce from the same company. Need to give it a try. In other leftover news…my wonderful sister Ele gave me a chubby little container of her home-made cranberry orange relish along with everything else she gave us. I wondered what I could do with it. It was all mine because Ralph only likes the kind in the can. This was just delicious! Never thought of it before, but believe me, I’ll think of it again! Now on to NaNoWriMo news! Having completed the challenge, I thought I deserved a treat. 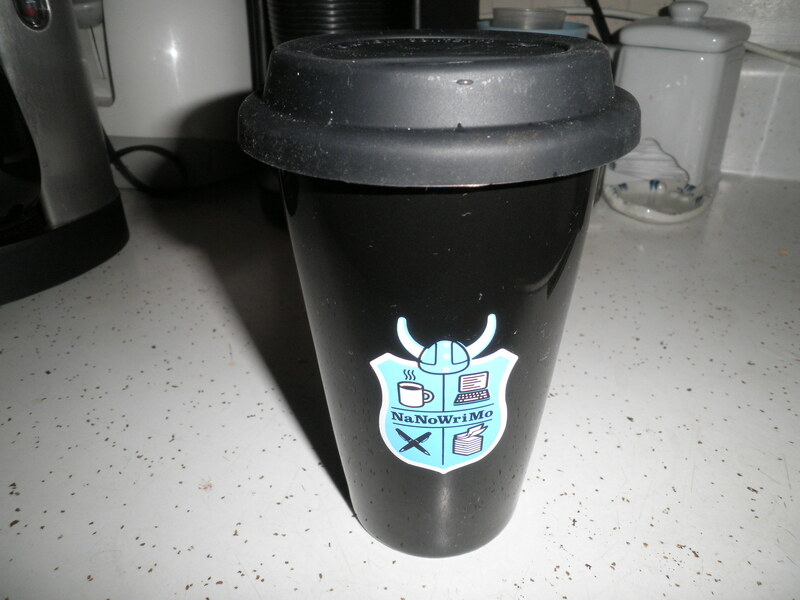 A NaNoWriMo coffee mug. It’s like the Fall one that Ele got me that I like so much, now I’ll have one for year round. It’s a beautiful sunny day out this morning. Chilly but we’ll take it if it sunny and clear. I have a lot of things I want to do today. I’m trying to focus. Always an issue for me. Just do it and ask questions later!! 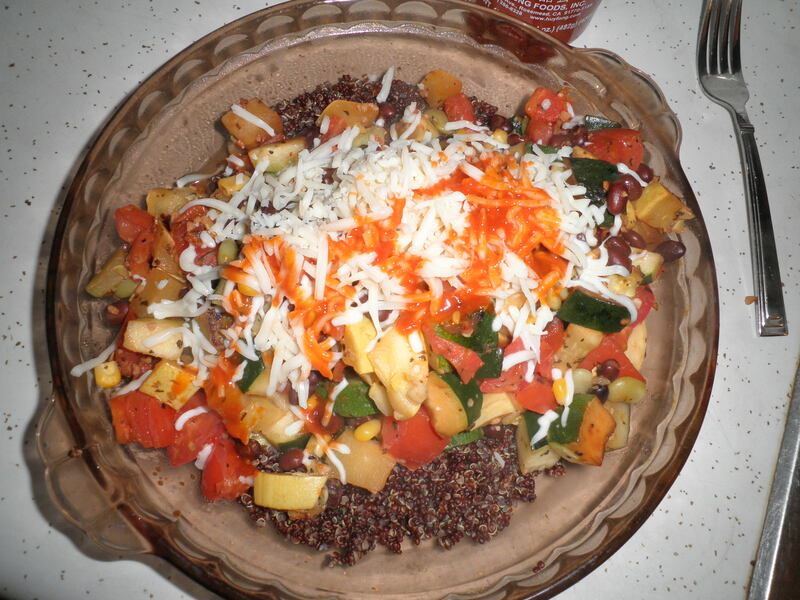 This entry was posted in Uncategorized and tagged beans, crock pot, quinoa, veggies. Bookmark the permalink. I am so proud of you! But, as I’ve said before, I’ve always known you were a winner!!! You definately deserve the mug and t-shirt. Now I’ll have to get one that says….I’m with the Smart Chick! Gram would be so proud of your new use for the cranberry relish. Another family tradition is born! One day we will have to share allof our peculiar family recipes with your readers….”pruins” with lemons….lentils and macs… tube biscuits with grape jelly and on and on! 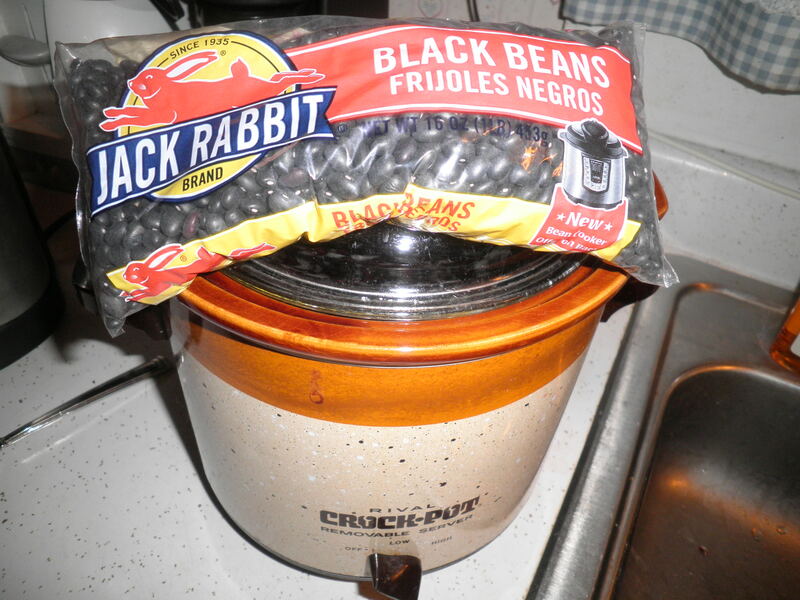 I soak my beans straight in the crock pot too, love black beans. I love ‘getting custody’ of food. If I don’t stealing must be done sometimes. 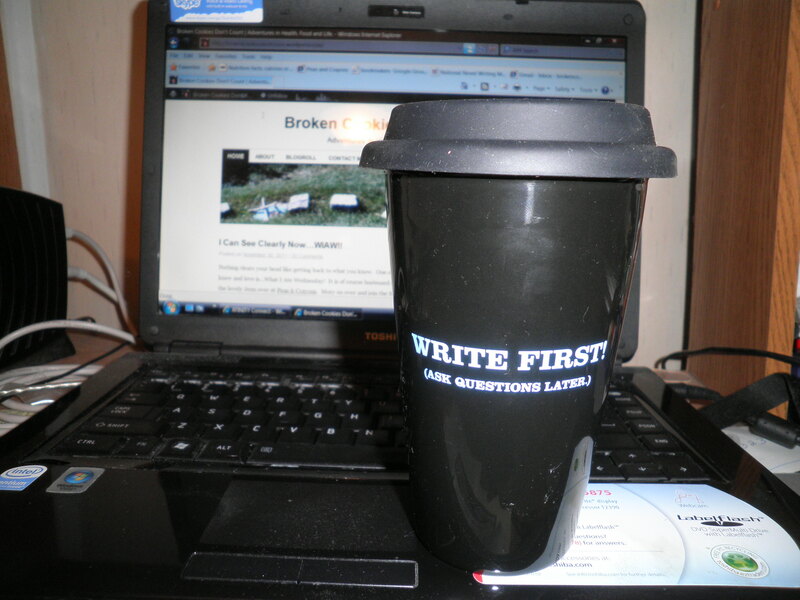 You absolutely deserve the shirt and mug, they inspire you to keep writing! Have a wonderful Thursday. Thanks, Marie, You’re so sweet. I could not get over what a difference there was in the taste of the beans. I’ve been making them myself for a good long time now. I only opened a can because that was all I had. The crock pot is my best friend!! Leftovers are so good, I can’t wait for Christmas until I get some leftover cranberry sauce! Hi Laura! This is a wonderful recipe that was my Grandmother’s. I should get it from my sister and share it. It’s been snowy here in Denver!! Wahhh!! I love the crockpoat soak idea. That’s the kind of laziness I can get behind! Thanks, Corrie Anne! We were in Colrado Springs in September. You are in such a beautiful area! My husband and I have a home in New Mexico and will be moving out there, hopefully some time in 2012!! Hi Jessica! Thanks for visiting! Glad you like my title and my food! I love veggies and I like getting creative with them. 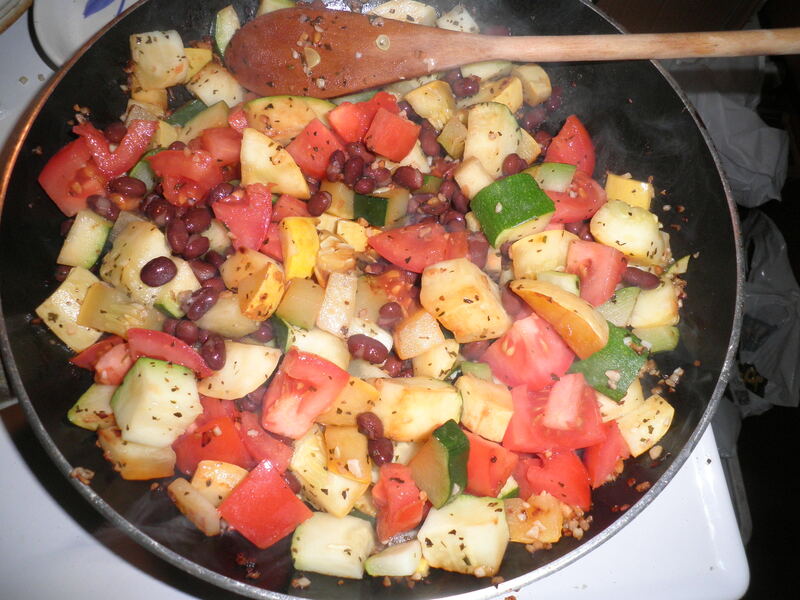 I love lots of veggies so they fill me up. Stay in touch. Health is what it’s all about. Please stop by often! You do deserve the gifts you gave yourself. It’s quite an accomplishment, and you are, in fact, one of few people that I’m aware has made it to the goal. Thanks, Jordan! I appreciate it. I was in a group with some other bloggers who were giving each other support and I think they’ve all completed the goal. They’re from all over the country, no one from here. I’m sorry to hear that there were others who tried and didn’t quite make it. I feel SO good about it! Cranberry orange relish…sounds amazing. I can imagine how tasty it is on oatmeal! Congrats again on reaching your goal. I wish I could do something as fantastic! One day. Hopefully. Thanks, Ameena. The cranberry orange relish is an old family recipe and as easy as can be. I’ll get the details from my sister and post them. You are so supportive and I really appreciate it. You can do it. Give it a try next year, or even before. I’ve been thinking of giving myself another goal like NaNoWriMo and trying to reach it. After the first of the year. 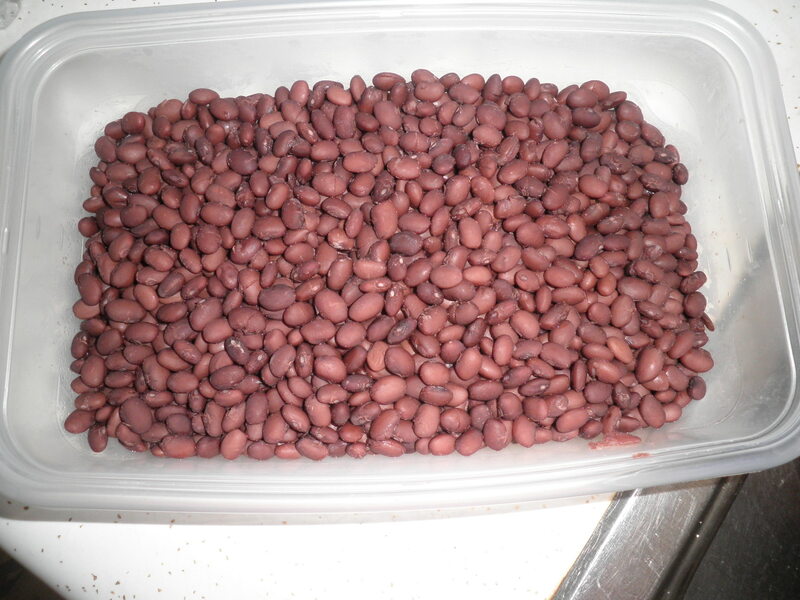 I love black beans, but I’ve never tried making them from dried beans! I bet they taste awesome. It’s something I’d love to do sometime, it’s not even that hard! 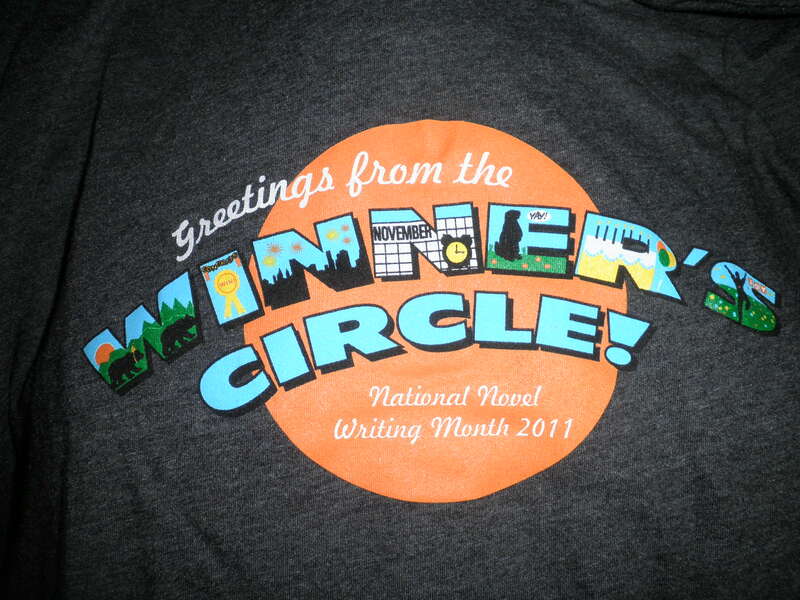 Congrats on completing the NaNoWriMo! Tara, making cooked beans from fresh beans is SO easy. I only started doing it since earlier this year. If you have a crock pot, I can explain it to you. I didn’t realize how much better the cooked ones tasted until didn’t have any and opened a can. Cans are ok in a pinch, but I’d rather do the cooked ones. Thanks about NaNoWriMo…it was fun! Now to keep writing! if only we had any left after i got to it on thanksgiving! but i’m with ralph… it’s gotta be the weird gelatinous kind from a can. I’ve never tried persimmons. Saw them at Verchios and I thought about it for about 10 seconds and then passed it by. Maybe I should give them a try. I haven’t read her in a while. I didn’t realize she had a baby…Cool! 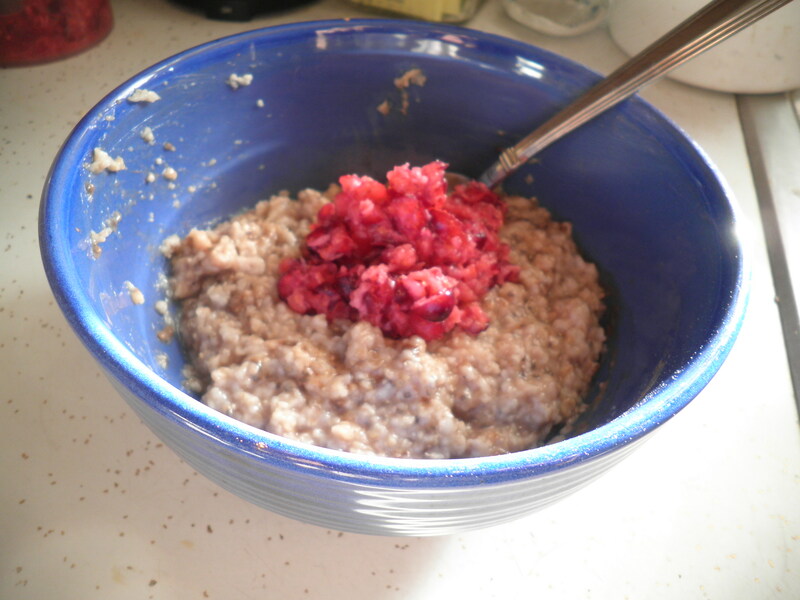 I was also introduced to the idea of cranberry relish/sauce on oatmeal..last week when I was provided with a homemade sauce and it was pretty tasty! I hope you enjoy wearing your t-shirt and using your mug. Also, thanks for your comments today..I replied to them, but wanted to say sorry about you missing your kitty again…I know how special they can be. Thanks, Zo, I do miss those crazy critters. I get to play with my best friend’s cat but she’s not especially friendly. Mine were always very loveable. I had gotten behind on my commenting so don’t think I forgot you. Just had to catch up! Haven’t worn my shirt yet, but I’m having coffee in my mugh right now! Take care!